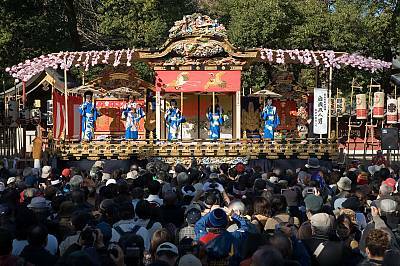 EN: Chichibu Shrine The Chichibu Festival is an annual festival performed mainly on December 3 every year in this Chichibu Shrine. 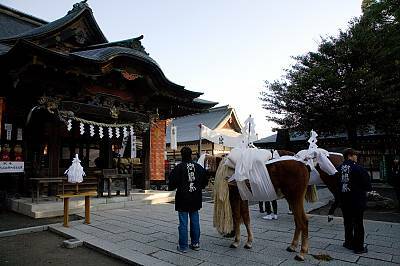 This picture shows early morning preparations for the offering of sacred horses in the Chichibu festival. EN: Visiting the Shrine The person concerned with the floats receives a talisman against evils from Shinto priesthood in front of the sacred gate of the Chichibu Shrine. 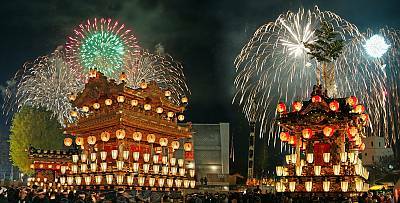 EN: The Parade of Floats The dazzling Chichibu Festival floats feature elaborate, vividly coloured carvings. 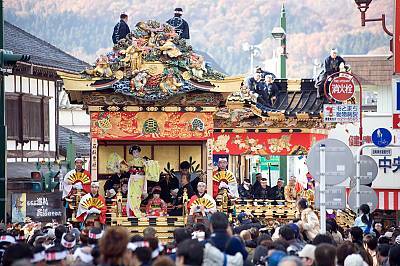 The six floats are of two types, kasahoko and yatai, with different structures. This picture shows kasahoko. EN: The exercise of the Chichibu festival music on the floats There are several communities, each responsible for a different float. 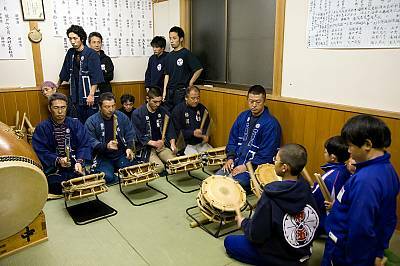 Practice sessions (called Narashi,) held every day before the festival, attract a lot of people. It takes as many as 200 people to tow each float. 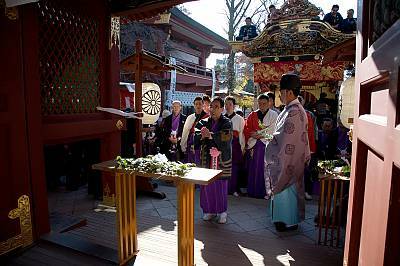 The festival music (called Ohayashi) plays an important role in binding them together. EN: Theatres staged on Floats The retractable wings are pulled out from the floats, and extensions are added to create a stage where the local residents perform sacred theatres in honour of the Shrine. The four communities take turns producing the performance. EN: Dances in towage During the parade, the floats stop at intersections and outside meeting places to dedicate dance performances (called “Hiki-odori”). 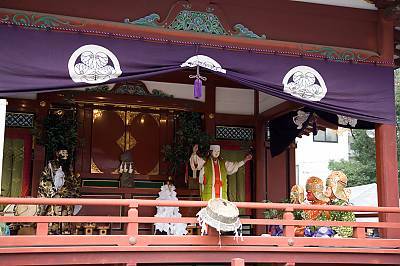 EN: The Chichibu Shrine Kagura On a purpose-built stage at Chichibu Shrine, classical ritual music and dances are performed. This is Kagura. The Chichibu Kagura is comprised of 35 masked dances based on ancient Japanese myths. 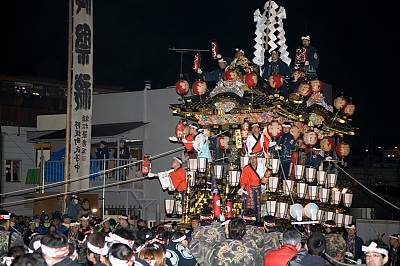 EN: The floats are towed up on the Slope"Dango-zaka" As the parade approaches Otabisho, the Chichibu Festival enters its climax: the floats are towed up on the Slope "Dango-zaka". As a spectacular fireworks bursts overhead, two extra ropes are added to tow the giant floats up on the slope in a dynamic style. 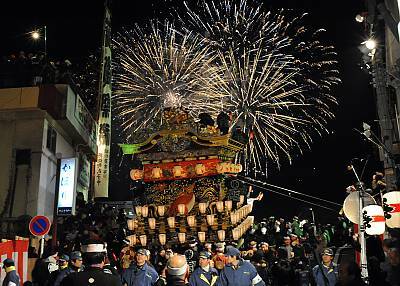 EN: The floats and the fireworks On December 3, floats called Kasahoko and Yatai gather for Otabisho at night. The fireworks display was added around a century ago. 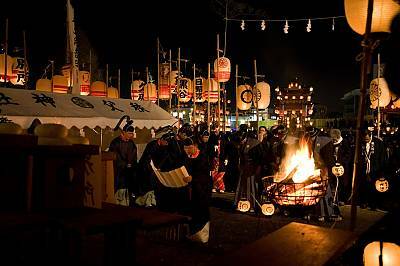 EN: Saijo-sai When all the floats reach Otabisho, it’s time for Saijo-sai, the purification of the sacred ground.